Rafael Nadal celebrates his victory over Karen Khachanov. 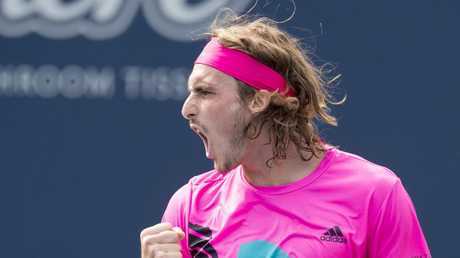 RAFAEL Nadal beat Karen Khachanov 7-6 (7-3), 6-4 to set up a final with birthday boy Stefanos Tsitsipas at the Toronto Masters. The Spanish icon will try on Monday (AEST) to spoil the 20th birthday celebrations of the Greek youngster who reached the second final of his career by beating Wimbledon finalist Kevin Anderson 6-7 (4/7), 6-4, 7-6 (9/7), saving a match point in victory. World No.1 Nadal won a battle of the tennis generations with Tsitsipas last April in the Barcelona title match. "To win this match is important, it's very important to be in the final of Toronto," Nadal, 32, said after running his season record to 39-3 in a match which ended after midnight local time. "I'm motivated every day when I wake up, there is always something to improve.